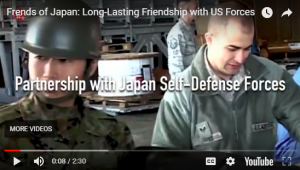 A new video, “Friends of Japan: Long Lasting Friendship with U.S. Forces,” features the Japan-U.S. Military Program (JUMP) and highlights the bonds created between U.S. Forces Japan service members and Japanese communities. More than 50,000 U.S. military personnel are stationed in Japan; with their families included, that total rises to 100,000. As the video highlights, service members often say the friendships they formed with Japanese residents are the highlight of their tour. “The best thing about Japan is the people, the respect they give, and their culture,” says YN2 Kevin Sharadin. JUMP provides opportunities for military personnel and their families who have served in Japan to continue their affiliation. “We hope those people who have now returned to the United States remain connected to Japan,” says Ambassador James Zumwalt, CEO of Sasakawa USA. The film was produced by the government of Japan. Check out the full video below.